By: D. Eric Smith, P.E. Modern Tilt-Up construction was first developed in Southern California in the 1950s. Technological developments made during World War II made it possible—notably ready-mix concrete delivery systems and the development of mobile cranes. Through its continued use and development over the decades, engineers have found Tilt-Up concrete construction to create structurally robust, economical structures. 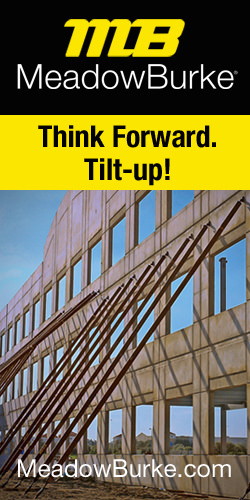 Tilt-Up construction has been used in 300,000,000 square feet of construction annually and is used in virtually every industry and market sector across the country. Although Tilt-Up is well established in the architectural/engineering and construction (AEC) community, in many instances, professionals are unaware the building method is a type of precast concrete. ACI 318-05 Section 2.2 defines precast as any structural concrete element that is cast in one position and moved to a different, final position. The commentary in Chapter 16 of ACI 318 also names Tilt-Up concrete as precast. Specifically, Tilt-Up construction is site-cast precast concrete. However, since the term “precast” in the AEC Industry has a very well-defined connotation, the use of the word often takes engineers by surprise. or manufactured precast concrete can come in a variety of different architectural finishes that are cast, formed or set into the face of the concrete panel. Since all of the concrete is batched on-site, the quality of the concrete batches overall can be higher than some equivalent ready-mix operations. However, two of the primary limitations of the use of structural precast are panel size constraints for transportation and production backlog. 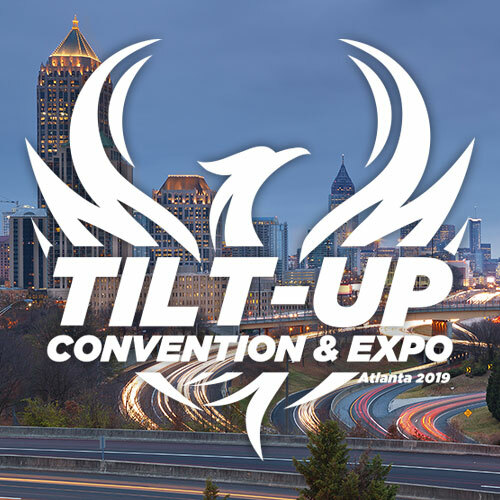 Today, Tilt-Up concrete (or site-cast precast concrete) has access to the same finishes as shop-cast pre- cast—including custom form inserts, recyclable form-liners, textures and a vast array of different cast brick/tile products. Unlike shop-cast precast, there are no shipping limitations—if you can lift it, then you can tilt it. This also provides the added benefit that most panels are only lifted and moved one time during erection, reducing the possibility of breakages or damage in transport. Embedded in the definition of Tilt-Up concrete as precast concrete are a number of benefits to structural engineers. One of the benefits of Tilt-Up construction is the increased level of inspection by the engineer and special inspector. Since most forms are broad and shallow, they provide the maximum access for optimal quality control. Due to this, ACI 318-05 7.7.3 allows the designer to use a smaller cover due to “plant conditions”—which is a term the commentary would include site-cast conditions when quality control provisions are met. The end-result is a larger design depth which provides improved strength and serviceability performance. by the Tilt-Up Concrete Association (TCA). When smaller cranes are used or there is limited casting area, the technology is also available to stack multi-story tilt-up panels on top of each other. For instance, a nine-story building may be constructed from a five-story Tilt-Up panel supporting a four-story Tilt-Up panel. Lateral performance can also be enhanced by improved design coefficients and factors for Seismic Force Resisting Systems. The load bearing Tilt-Up panels meet the criteria of “bearing wall systems” as defined in American Society of Civil Engineers (ASCE) 7-05. Therefore, it is possible for Tilt-Up shear wall panels to be classified as ordinary precast shear walls, intermediate precast shear walls and special reinforced concrete shear walls. To design an ordinary precast shear wall, Chapter 21 of ACI 318-05 defines that all requirements of Chapters 1-18 be met. In order to meet the requirements of the intermediate concrete shear walls, refer to the requirements in Chapters 1-18 and Section 21.13. To upgrade further to the special reinforced concrete shear wall classification, the requirements of Sections 21.2 & 21.17 will also be necessary. Above grade, the design and detailing of this requirement is similar to those requirements for shop-cast precast and cast-in-place structures. These requirements can be satisfied by considering the support of the diaphragm and the longitudinal edge elements connecting it to the wall at each framing level. When additional capacity is required, the single-story panels may be tied together with continuous weldable reinforcement block-outs, welded stitch plates, etc. It should be noted that any edge of panel embeds used for these purposes should be properly reinforced to prevent cracking from thermal forces, shrinkage, etc. The debate of the panel connections becomes more significant when discussing those connections at or below grade. When the overturning analysis is performed for shear walls in a single story Tilt-Up concrete building, a significant number of cases there is no net uplift from overturning at the base of the panels. For those instances when there is net uplift on the base of the panel, engineering mechanics dictate a positive connection to the foundation. The detailing of these connections should meet the requirements of Section 16.3.2.2 of ACI 318-05 which states, “Where tension forces occur, a continuous path of steel or steel reinforcement shall be provided.” However, when no uplift is present, how can an engineer designing Tilt-Up panels meet the requirements of Section 7.13.3 and how should the attachment for uplift be made? The rationale above provides a clear load path of how slabs and single story panels can be detailed to create a building envelope with heightened structural integrity when no net uplift on the base of the panel is present. ACI 551R-05 advises in Section 2.8.6 that panels may be interconnected or connected to foundations for in-plane and out-of-plane loads, but does not require the implementation of such a connection. Rather, that Section is intended for cases where a connection to the slab to resist those forces is either not present or is not adequate without added resistance provided by additional connection to the foundation. Given that it is possible for an appropriately reinforced slab-on-grade to stabilize the base of a panel, is it possible to detail a Tilt-Up panel to a foundation without a connection aside from a non-shrink grout bed? The ambiguity created between Section 7.13.3 and Section 16.5.1.3(c) regarding panel/footing connections continues to be a discussion among the varied schools of thought. Any given interpretation will likely be based on the derived meaning of the phrase “tie elements together.” Are the elements only precast elements or are they all structural elements? TCA-P-002 ends by saying, “Connecting Tilt-Up wall panels to the footings is certainly one method to satisfy the building code requirements for transfer of forces, but is not the only way. To arbitrarily require a particular connection/load path is not logical and may not produce the desired results. Whatever load path is used to transfer forces, all elements must be designed accordingly for those forces.” Much has been written concerning the design of building shells for strength, ductility, integrity and redundancy. In contrast, little has been written regarding those requirements when keeping buildings on the foundations in seismic events or unexpected movements in the sub-grade. It is not recommended to omit or limit any connection of the base of a Tilt-Up panel to a foundation — or between any structural elements – required by engineering mechanics, the building codes or prescriptive measures. When connections of Tilt-Up panels below grade to a foundation are required, engineers should appropriately protect them against corrosion. The Tilt-Up Construction & Engineering Manual, 6th Edition also notes that connections made on the exterior face of the panel are subject to accelerated corrosion. It should be noted that applying a covering of concrete alone is not adequate for waterproofing. Different regions and connection details may require different waterproofing applications therefore engineers should be sure to consult a water-proofing consultant in your area.